There are countless leadership books, but how many will actually help a Taco Bell shift manager, a Fortune 500 CEO, a new entrepreneur, or anyone in between? 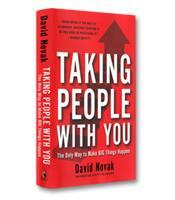 David Novak's new book Taking People with You will. Novak knows that managers and leaders can make things happen by one skill: getting people on their side. He offers a step-by-step guide to setting big goals, getting people to work together, blowing past your targets, and celebrating after you shock the skeptics. And then doing it again and again until consistent excellence becomes a core element of your culture. How to get inside the heads of your people. How to practice "extraordinary authenticity." How to look for good ideas in unexpected places. How to choose a can-do mindset. Why you should cheer for first downs, not just touchdowns.